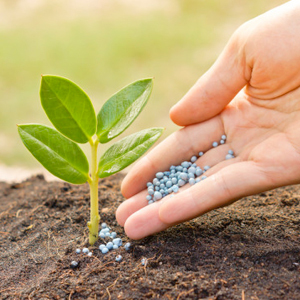 Fertilizing is an essential part of gardening in keeping your plants and trees healthy and making sure they get all the nutrients they need to stimulate their growth. N = Nitrogen Photosynthesis (is the process of plants converting sunlight to food) Plants use nitrogen to help produce chlorophyll; the main chemical used in photosynthesis. There are many types of different fertilizers. Before deciding which to choose the types of soil, plants, shrubs or trees being fertilizer should be considered before you start. Remember in fertilizing; more is not necessarily better and over fertilizing can even damage your plants. Lilly Miller Citrus and Avocado Food is made with natural ingredients. A must for healthy growth for any citrus tree. This product helps produce lush trees and delicious fruit. Loaded with nitrogen, a must for all fruit trees. You can count on Lilly Miller to get your citrus trees off to a great start. Continue feeding it for up to six weeks. Happy Frog is an all-purpose fertilizer and is a well balanced premium organic product that keeps your plants healthy and supports growth all season long. Happy Frog is a granulated, easy to use fertilizer that gently releases vital food along with helping your plant fight off disease. Start-N-Grow Premium Plant Food; this natural product is a slow release plant food. It is ideal for use at planting time and to help maintain your plants or shrubs. This product should be applied every 3-4 months during growing season. It is a great fertilizer for roses, trees, shrubs, bedding plants and indoor our outdoor containers. Osmocote Plus Outdoor and Indoor Smart Release plant food – This product has 11 essential nutrients. This super plant food feeds your plants up to 6 full months. This Scott product gets great reviews and can be counted on to deliver the right combination of natural minerals to keep any plant healthy. A must for any serious gardener. Hi-Yield Bone-Meal; along with Hi-Yield Blood Meal contain natural nitrogen phosphorous and make up a combination of fertilizing products that are great for any flowers, shrubs and a must for your vegetable garden. Hi-Yield Bone Meal is derived from steamed bone meal and slowly delivers natural phosphorous to help develop growth and maintain a hardy root system. “Blood Meal” is a natural source of nitrogen and helps to create greener plants and faster growth. This product also helps bring out the color of any plant. Before using any fertilizer, carefully read the instructions. The Green Goddess has a huge selection of different types of plant foods and a representative is always there to assist you.